Summer may be coming to an end, but that doesn’t put an end to my love for yummy salads. This lentil salad has been one of my favorites and will continue to make an appearance this fall. 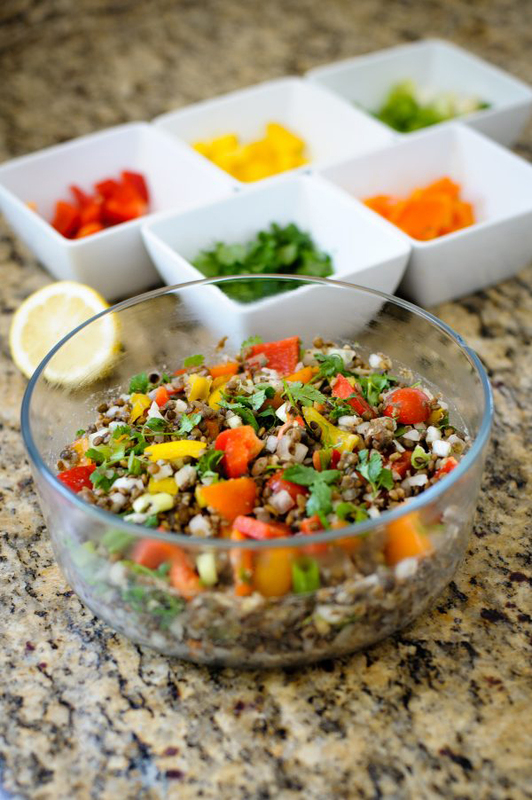 This lentil salad makes for the perfect side salad to serve at dinner or bring to an upcoming football party. It also makes for a great meatless option for those looking to pack in protein without the meat. It’s loaded with delicious flavors and protein, not to mention gorgeous color, with all the different ingredients. It actually can be served as a complete meal, since it has the perfect amount of proteins and fats. One serving has under 200 calories, 24 grams of protein and only 10 grams of net carbs! Give this one a try and let me know what you think! Simply place all ingredients in a large bowl, mix well with a spoon and allow to chill for a few hours before serving. Can be served right away but if you allow it to sit, the flavors come alive that much more. Serve as a salad or better yet, turn this rainbow salad into the most perfect vegetarian lettuce wraps!